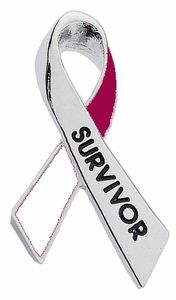 Head and Neck Cancer Survivor Ribbon Pin. This is a very special pin. You are a survivor from the moment you hear the words, "You have cancer!" You are a fighter, and our Survivor Pin will let you show the world that you may have cancer...but cancer doesn't have you! This beautiful 1 and 1/2" silver-tone pin is enameled with your cancer color and debossed with the strong word "Survivor." Whether you are newly diagnosed or 20 years out, this beautiful new design is a must have for you or someone you know. Make sure to see our full selection of Ribbon Pins for more great ideas and gifts.